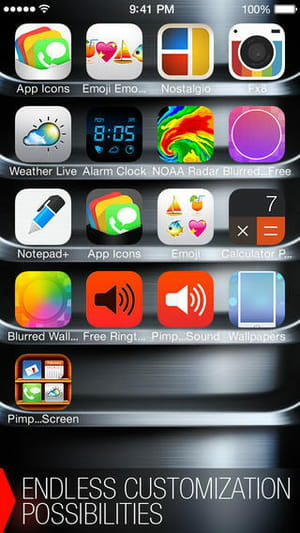 Designed by Apalon Apps, Pimp Your Screen - Custom Themes and Wallpapers for iPhone, iPod touch and iPad is an application that lets users customize the look of their iOS devices. A wide range selection of backgrounds, app shelves, neon combos and others can be used at any time. Note that it is an award-winning application. App shelves collection: Pimp Your Screen - Custom Themes and Wallpapers for iPhone, iPod touch and iPad stacks up numbers of templates to add as App Shelves. The user just has to pick one of these shelves to apply to the iOS device. Icon skins and wallpapers: icon skins can be customized depending on the user's needs at a given moment in time. Ditto for wallpaper, they are multiple and categorized by theme (Abstract, Sci-Fi, Animals, Nature, Holidays and others). Images are in Retina or standard resolution. Lock screen: Pimp Your Screen - Custom Themes and Wallpapers for iPhone, iPod touch and iPad is featured with numbers of lock screen. This means that users are free to choose the images, actions or animations when switching on the display. Sharing option: images, wallpapers and other eye candies can be shared on some social well-known social networking websites. They can be shared on Facebook, Twitter and Instagram. If not, they can also be sent to friends via email. This app works with iPhone, iPad and iPod touch and is optimized for iPhone 5. It offers a rich database of templates. Latest update on November 20, 2016 at 05:42 PM.